28 MMS September 2017 mmsonline.com RAPID TRAVERSE Machining Technology in Brief database and use the software functions. The hosted data is stored in standardized formats that enable it to be downloaded through the MachiningCloud app for import into CAM pro- gramming systems, CNC program verification/ simulation systems, and tool management and other shop software applications. Primarily, the standards dictating the formats for digital representation of this cutting tool data are ISO 13399 (Cutting Tool Data Representation and Exchange) and GTC (Generic Tool Catalog). GTC, which is a complement to the ISO standard, provides a vendor-neutral classification of cutting tools and specifies data file structures. GTC tells vendors how to "package" their digital catalog information in a uniform way so that end-users and third-party application developers can access and incorporate information from the vendors' catalogs more predictably. MachiningCloud also follows MTConnect, the industr y standard developed to facilitate the exchange of proce s s infor mation f rom CNC machine tools. Moreover, the company offers a service by which data from cutting tool manu- facturers that is not yet compliant with ISO 13399 or GTC can be published and made available to MachiningCloud app users, who can access the data and conver t it to the format required by their own applications. An important aspect of the company's cloud- based database is that the cutting tool product d at a ava i l a b l e f ro m th e m a n u f a c tu re r of te n includes 2D drawings and 3D geometric models of individual tooling items as well as cutting tool assemblies. This is in addition to the cut ting speeds and feeds that may be recommended by the manufacturer. Another important aspect of MachiningCloud is that it offers subscribers various software utilities for creating tooling lists, managing and routing jobs, checking tool pric- ing and availability, submitting purchase orders, and so on. These utilities enable the user to leverage digital cutting tool data to help stream- line work flow throughout a shopfloor operation. However, many subscribers initially are attracted by the ability to access one industry-wide database of cutting tool products. 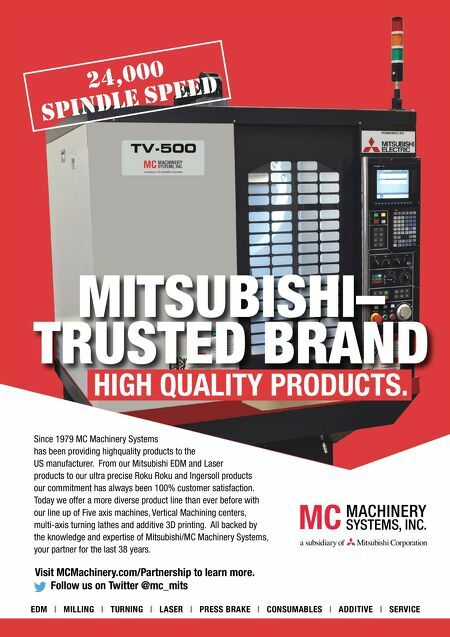 For NC programmers, for example, this is a time-saving alternative to searching paper or online catalogs of cutting tool products from individual cutting tool vendors. Tooling items can be downloaded to create a tooling librar y and to populate the data fields required by CAM software to generate CNC tool paths. Because tooling vendors can upload fre- quent updates to the MachiningCloud database, programmers have greater assurance that the data is the latest and most complete. Another benef it is the abilit y to download 3D geometric models and cutting parameters i n to C A D/C A M s o f t w a r e f o r C N C m a c h i n e simulation, verification and optimization. 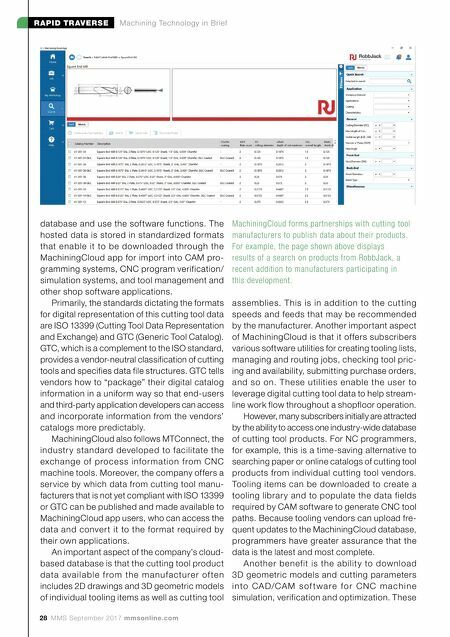 These MachiningCloud forms partnerships with cutting tool manufacturers to publish data about their products. For example, the page shown above displays results of a search on products from RobbJack, a recent addition to manufacturers participating in this development.